Google Reader is one of the better online feed readers. It sports a nice ajaxy interface and runs reasonably speedily. However, I have 239 feeds in my Google Reader account now and I wish to delete most of these. The only problem is that there doesn’t appear to be a way to delete more than one feed at a time – with 239 feeds registered, I could be a while doing this! 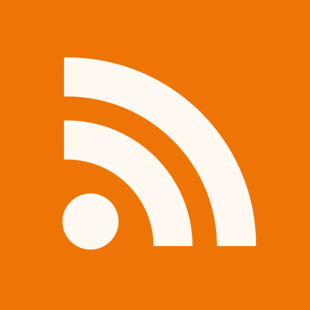 Does anyone know if there is a way to delete multiple feeds simultaneously in Google Reader? 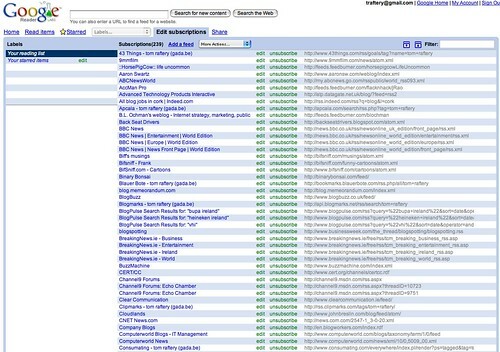 Finally you can subscribe to an Irish job search! Amazon – "No Irish need apply"
no i don’t think there is… it took me an eternity to do it about a month ago when I swapped to google reader. It’s got way better recently supporting flickr subscriptions and podcasts embedded. I also like the G L shortcut keys. Here’s an idea though, you can export to opml. edit in notepad (delete the lines you don’t want) then import again. But how do you clear you account in one go before you do that, I don’t know! sorry. Even when you delete a subscription by hand, you still have entries for the feed in the reading list, so I’m not sure how to get rid of those. I switched to Bloglines. Came back to Google Reader for the embedding into personalized Google page. But still can’t delete old unread articles easily. So, I’ll be sticking with Bloglines which works well. I am in no way a techie…and I thought it might be nice to have enviro “feeds” and so I punched that in to discover…good heavens, one fourth of my screen is a big blank…and I have to move the whole screen even to enjoy yahoo. This is going to RUIN my computer enjoyment. I want to get my space back….right now. It is possible to say No Feed now. I certainly hope so…..
yhis. There must be a way to remove Google Reader. I have a feed from somthing called piasamaker. The darned thing completely covers my hame page. Can any one Please tell me haw to kill this monster!!!. is this problem solved yet? cuz I seem to find out where to delete the feed. go to [setting] on the very top right hand corner (right beside your g-mail address. The first page is [preferences], then go to [subscriptions] right beside preferences. simply check the box on the left of the unwanted feed and click the bright/small [garbage sign] beside [rename]. Done. go to setting on the very top right hand corner (right beside your g-mail address.then go to subscription page.then mark the site you wish to remove.then click unsubscribe.thats all. If you can put up with the amount of memory Windows Live Mail takes from your device, it shows feeds very much in the same way as it does an inbox. You can simply zap out any that you don’t want. And even a non-tech-savvy dunce like me worked out how to configure Live Mail to pick up my Greader feeds. Still view in reader, though, as (with many Windows programs) running Live Mail just kills everything else I’m working on to a snail’s pace. Until G give us the option to delete one, all or some feeds, as they do in Gmail, there is no happy medium. Bummer!